The Last Post... well for the year at least. Here we are folks the year almost at an end, big projects up ahead: Lamplighter's release imminent, Book 3 to finish, further books to ponder and plan (see how Book 2 is received first, shall we...), get that Half-Continent map up and running at last - a bit of a theme with a couple of posts ago, things to do, planning ahead, getting my scattered brain in some appearance of order. Might try rambling about something else. Anyone else go through this? Anyways, may I just say HAPPY NEW YEAR; may this new one be most excellent for us all. "...can we submit sketches for the character studies? Or will it all be text?" A most excellent idea. Indeed, the thought did cross my mind to have illustrations of your characters. It should work so why don't we give it a bash. Send your picture of your character to dm.cornish@halfcontinent.com and I shall see what I can do to include them the featured profile. "I'm wondering what, if any, fantasy films which have been adapted from books you've enjoyed, and which ones you think fell short of their source material." Hmm, I sense dangerous waters ahead. I have to say of the few adaptions I have seen not very many at all come up to snuff (IMHO - this is all to be taken simply as my own perspective). Some are very fine to look at and are so thoroughly done. For example, I am thinking of Mr Jackson's fine go at LOTR - my own response to Mr Tolkien's work was and is so strong I was never going to be 100% satisfied with any adaption. I own all three extended versions of the films and just LOVE the hours of behind the scenes documentaries (as an illustrator it is my deep wish to be involved in such a process); I love the passion and earnest hard work of the whole team of folks who made the films and had I not known what love they had for the text and the work I would like the films as much as I do. LOTR is just to unwieldy to make in a more pure form and would probably appeal to far fewer folks (just us die-hards). The Narnia series is promising to be wonderfully thorough - much simpler stories to adapt; the battle at the end of Lion,Witch, Wardrobe is astounding - that pause in the sound just as the armies are about to clash sublime. The Conan films are not anywhere near the texts. H.P.Lovcraft adaptions always turn into shlocky nonsense, and so far from the grim and serious tensions of the text. I have to humbly admit the most horrendous crime that I got into Harry P only after seeing the first three films and began reading from there. Having confessed that I find the films adequate precis and very expertly done but the books hold more as they almost always will. There is much more - I am sure I am making some huge oversight, missing something, but this response is not exhaustive. Of spec-fic the one adaption that has actually improved my sense of the book is David Lynch's Dune - superb, new visions, improved understanding, a complete work in deep respect to the text and abridged so thoughtfully. 10/10. Another would be a non-fantasy (if I may): Peter Weir's Master and Commander: The Far Side of the World, a perfect coagulation of all that is brilliant about Mr O'Brian's astounding set of books - I did not mind its very loose adaption at all, it caught the very soul of the text and distilled it beautifully. The Extras DVD is very insightful too. In a perfect world I would very very very much want to have Mr Weir do a version of MBT - or for it to have a vibe more like Master and Commander rather than say the Dungeons & Dragons films, more honest and low-key, not the smash-bash-treat-the-audience-like-they-have-no-subtlety that is the norm; music scores that are in the background not out in front demanding and dictating audience reaction - string quartets not full orchestras (a much more Half-Continent sound anyway), big "empty" audio spaces, fights filled with the drama of the sounds of combat rather than overwhelming musical stridence (sic), fulgars fighting with flickers and flashes of electricity like a subway train not great arcs of lightning spraying all over the place, etc etc etc... You can see that I have thought about this a bit. Anyway, I had always said to myself I would not put up too much of my opinions of others work and here I am doing just that. You tricked me into it Lawrence, dang it. What are other people's thoughts? It has been a most excellent year and I thank you all who have put your thoughts here and entered into the dialogue - a very healthy and helpful thing from my point of view, and I hope for you too. The posting of the preview chapter seems to have gone down alright - I was a little worried there that I had done the wrong thing by putting it up - and I cannot wait until April/May and onwards either, the full story at last! ...not some mean glimpse. 1. Answer questions about how Book 3 is going, movie deal$, and on the possible autobiographical nature of MBT. 2. Periodically feature one of your most excellent and revelatory character studies in the profile section. 3. Say something clever about the two polls currently up (of which the general opinion is pretty clear). 4. Start some new polls - and ask you all for any ideas regard this. 5. Do some more word challenges. ...oh, and write Book 3 (probably optional). May you all travel safely and find joy this Christmas and New Year; if i could I'd have you over at my new pad for a party (a very sober and serious party where we'd discuss heavy ideas and solve the worlds ills - in theory). I might squeeze in another post or two before the end of all things 2007, but either way, take care - it is a better planet knowing you all exist. A very sneaky preview indeed... Chapter 1 of LAMPLIGHTER! My word, I sure hope you all like it - consider it a Christmas present. Merry Jesusbirthday (as I like to call it) and may it be a brilliant new year for everyone of you. I am being very UP here - might need to include a few bah-humbugs next post. 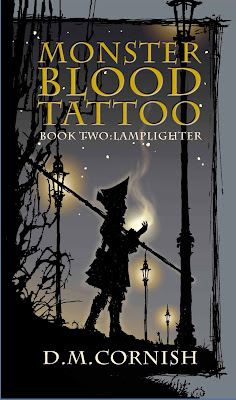 Here is the front cover of the UK Edition of Lamplighter. Lovely, lovely, lovely; I am liking it a whole lot - it has a wonderful flavour all of its own. Your thoughts? Go here to see the US and ANZ covers if you have not glimpsed them before or just want a refresher. And please keep the answers to these questions coming - I cannot enthuse enough about how great the answers have been . If you want to read other people's most excellent ideas, for now check the comments here, here and here. Not too long ago I was honoured with an inclusion in the SA (South Australia) Great 2007 Rising Stars program. It included a whole range of younger folks: business people, scienticians, athletes, teachers, inventors and other clever clogs all from this home state of mine. It was truly an honour to be included, though I felt inferior to the rest - but whatever. They produced a magazine to go with the award and here is my interview therein - just for those who might be interested. The kinds of questions asked made for slightly different answers from some of the other interviews already linked. Check it out if you dare. On an unusual note, there was a birthdate cutoff to be eligible to be a Rising Star and this little duck only made it by about two weeks. Phew! Not as young as I look it seems. Probably a bit too much of my-own-trumpet-tooting going on here - I will get to Lawrence's question soon... honest! "I have just finished reading Monster Blood Tattoo and have a question I was hoping you could answer for me… Could you tell me from where you derived the name you gave to the Imperial language?" So, now both she and you know. Also, regarding giantfan's inquiry into those who study the weather in the Half-Continent. Well, they are not particular folks like we have meteorologists in our own world, though certainly some natural philosophers have more than a passing interest in the movements of winds and rains. Barometers exist too, of course, for telling whether conditions are remaining fair or turning foul. I will get to Lawrence's question about the auto-biographical nature of MBT soon. Speaking of Lawrence, you should head on over to Lil' Chief Records and have a listen to the tunes on his jukebox. After that you need to go check out Coz's tunes, Rabbit Weather. And while you listening to the sweet music, please please try your hand at answering these questions. I tell you truly, my sense of the H-c is so expanding just knowing and thinking of these independent lives moving about it, characters of other people's imagination dwelling therein - it is almost like these inventions of yours have become autonomous entities in my imaginings. Totally unexpected and so very very "cool"! A galley - I have the proof. Yesterday I received from Tim Travaglini - my US publisher-man - what in the US publishing industry is called a galley (here in Oz we called them ubers, or somesuch - not sure why, probably an acronym) of Book 2, Lamplighter. This galley is what most folks would call an uncorrected proof. Indeed, that is what it says clearly on the front: "UNCORRECTED PROOF NOT FOR RESALE"... and uncorrected it is: I am still working with Mr Travaglini to make the final adjustments for the US edition. But the best bit is that a galley is actually an early, paperback version of the book! Yipee! It looks very nifty, I near took it to bed with me as some kind of blankey... and talk about thick! Now I reckon it is not seemly to judge a book by its weight, but deep inside some part of me cannot help but go "HURRAH! Look how dense it is! " - 730 odd pages with all things included. "Did I write that? It looks just like a bought one," I marvel to myself much more than I did with Foundling, but too much self-congratulation is not a good thing so I stop. Just to note, there is a little treat in Book 2 for many of the brave souls who have contributed to this blog with their comments. Speaking of which, thank you very much to those who dared to answer my questions last post, your entries were brilliant. In fact they have helped greatly in expanding my sense of people moving about independently in the Half-Continent, doing their thing apart from any narrative. It would be great if others would give them a go too. And as requested today for breakfast I had Apricot Fruity Bix[TM]. So who in the Half-Continent would you be? It occurred to me that it might be really rather interesting to know that if folks were citizens of the Half-Continent what type of person they might be? What would be your name? What part of the Half-Continent would you live in? What would be your social station? What profession might you choose? Would you be a sedorner (monster-lover) or invidist (monster-hater) or somewhere in between? What would you look like? Would you have spoors or cruorpunxis? What else would be interesting about you? I am thinking I could perhaps do a little profile of each response in the side bar, a new one for each month - and "Introducing..." kind of thing. Please, answer one, some or all of these as you feel, let the world (and me) know - I reckon this might be a tad fun. Oh - and Happy Thanksgiving to those for whom it is relevant! This is a replica of the 10 sou folding-money note (sometimes called a folder) that Rossamünd received from Europe just before he departs for Winstermill - actual size is about A5. The red stamp in the top left corner is the Imperial Sigil made as deep-dye mark. Pressed into the bottom right corner is the Sovereign Marque - made using a form, a metal rod cast with a state's sigil - or marque - which is placed on the paper and hammered once and firmly with a small mallet to leave an imprint in the paper. Such forms are highly valuable items - I can see certain insalubrious folk plotting how they might steal one to further their own nefarious causes. The sign "A.V" in the marque stands for "Arius Vigilans" - the Vigilant Ram of Hergoatenbosch. I thought some folks might be interested in knowing what folding-money looks like. I have been spending some of my inbetween-books time (that being Book 2 Lamplighter - now with the printers - and Book 3 - still no official title yet) figuring out the convoluted systems and industries surrounding the production, issuing and redemption of the humble folding bill. Such periods of pointed and concerted invention are enriching, giving me an continually expanded view of just what makes the Half-Continent work; all those folks bustling about: the printers and their secret-vault presses, the guarded trucks taking the bills to banks and other authorised issuers, the halls of clerks keeping track of the movements and uses of the bills through an unwieldy system of logs and ledgers, the revisionists sent out to investigate frauds and forgeries. Fun, fun, fun. internet = technically it would alternatively be known as the astrapemethodologue or fulgurcoetre ("electrical gathering") shortened to the fulgurcot, though once more the vernacular would be the somewhat simpler epistulane, with emails being commonly called epistles (a briefer form of fulgepistulës) or coets. democracy = well, technically I could simply use the word "democracy" and be done, but where would the fun be in that?! So the Gotts for example, have two terms for it, stimmanteil ("voice-sharing") used in a positive sense, and lumpelämend ("rascal-noise") used pejoratively. Given that the Gottish political system is essentially an imperial dictatorship, lumpelämend is the more common in current times. In the Haacobin capital, Clementine, the term vox paritas ("equal voice") is being thrown about more and more frequently, it detractors deriding it as glaucaloquia ("sweet-talking") - a whole lot of frothy nonsense: the Empire will not stand - and therefore the dominion of men against the monsters - (so they say) if power is shared about to any old person just because they feel they would like to have a go a running things. Keep the challenges coming, please. Also, would you keep Jay (I introduced you to him last post) in your thoughts: he is going through very tough times at the moment. Howdy, sir, how are you doing? I hope better today. "*Research and write a report about the author of the novel. Include information about their life and books they have written. Also include a photo of the author. *"
So, via his mum Rita, he asked me some questions about writing and the book and myself, did a whole lot of hard work and handed in the report early. Better yet, when he got his grade back he had achieved 120 for it! Woo-stinkin'-hoo! Well done, Jay! "Europe, because she can shoot lightning." The next book for Jay's project is called The Alchemist by Paulo Coelho. Rita says, "Jay likes it for one of the same reasons he likes MBT; the hero is a young boy that he can identify with. We shall see how he goes." We shall indeed. May you get equally high marks for this, too, Jay! 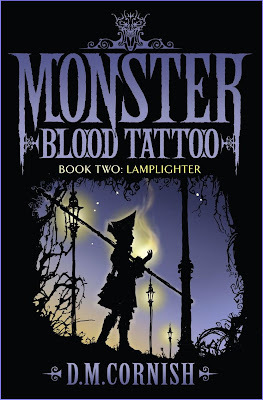 Above is the US Edition cover for MBT Book 2: Lamplighter. Below is the ANZ Edition hardback cover. 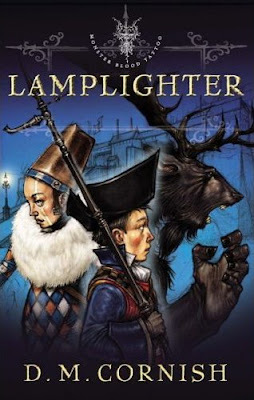 Lamplighter (ANZ Edition) has gone to the printers! 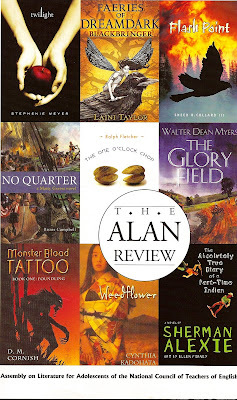 The U.S. edition of MBT: Foundling has made it on to the cover of the ALAN Review, along with Laini Taylor's Faeries of Dreamdark: Blackbringer - she and I are stablemates at Penguin. Laini has an excellent site on the struggles of writing over at Not for Robots - I found myself agreeing and encouraged by almost all she says. Writing is hard - I certainly find it so, like pulling teeth without anaesthetic; so heck it out if you want a lift to your flagging authorly spirits - indeed for those who want advice on such things on getting published, I think Liana is a better source of advice than I. This is a signal honour, thank you ALAN! There is apparently no actual review of MBT 1 in it though ... so there you go. Half-Continent definitions for real words and more meaningful content will be coming soon; meanwhile you should still go and check out the marvellous images made by MBT readers in Spain. May I invite you all to head over to the Spanish MBT website, Tatuaje de Monstruo. There they have run a drawing/painting competition and the results are just - well - wow! It is hard to describe the feeling of seeing such a response from others to my own ideas - it is a very very good feeling, that is for certain: community, sharing, connection - these are all there. Le agradezco de mi corazón por sus imágenes maravillosas. Son verdad hermosas y me ayudan a ver el Mitad-Continente (del Continente Central) de maneras mejores que hice antes. Digo otra vez le agradezco! It is getting a tad serious here. I am afraid I might be exhausting people with all the heavy pondering. Therefore, in response I'd like to show how I look - if I were on The Simpsons [TM]. I am probably waaaay behind; you all have probably known about Simpsonising [TM] yourselves for ages. I would love to see what you guys might look like as citizens of Springfield [TM] - not sure how though - perhaps you could post them somewhere then leave links in the comments? Maybe that'll work? After the last post I have some questions rolling about my head. If a book that truly was objectionable is published would it be best to ban it (no doubt increasing focus on it and therefore sales) or leave it be and hope it evaporates into obscurity? If a child you knew (son, daughter, niece, nephew, younger sibling and all the rest) wanted to read a book you had doubts about do you let them just read it - not wanting to impact their liberties - or ban them entirely - seeking to preserve their innocence? Or would it be better (though a whole lot more work) to read the text first or along with the child and then discuss the objectionable parts and give then some perspective? Being that I have been married a little over a year and children are a possible future for me, this is becoming startlingly relevant. Anyway, nothing particularly new in these queries, they have been a vexed issue for long before I was ever pondering them. Discovered this little gem not so long ago - found here and written by THE HON. DR GORDON MOYES. So if I read it right by the inference, I reckon I can say it is official: MBT is an objectionable book. I wonder if the Honourable Mr Moyes formulated his opinion on a thorough reading of the text or rather by a cursory and shallow assumption based on the title alone? I fear it was probably not the former. Either way, I feel like I've won something and do not know who to thank first. A new month, a new post - got to give this regularity thing a chance. And to help keep things interesting I am introducing a reader poll (yipee!) - over there on the right, just down a bit, feel free to answer. Mooseguy asked: "1. What is/are your favourite animal(s)? 2. What sort of music do you like? Do you have any favourite bands? Oooh! And poets? Any favourite poets?" Animals would definitely have to be the deep-sea viper fish, gulper eel, sperm whales, whale sharks, land crabs, moon jellyfish, pangolins, goats & sheep, the common house fly, any kind of bird, dogs in general - though those small out-of-control yappy ones are hard to appreciate. With bands I would say go check out my profile for a more comprehensive list, but in direct answer to the question most certainly New Order were my first big love. Right now I am getting into a great debut album by Abby Dobson - sweet gentle Australian sounds, an amazing voice. In fact, I also have made some of my own electronica for many years calling myself Methods of Recorder - no official releases though, just what I call "grey" labels, that is self-made cds for friends. I am no musical genius - that is for sure - but I do (dare I admit it) like my own tunes. As to poets my clear favourites are Wordsworth, Shel Silverstein (I L-O-V-E Where the Sidewalk Ends), Lewis Carol, Mervyn Peake and Aidan Coleman whose words are a sweet suburban lullaby, the lyric of tiled roofs, treed streets and empty ticking rooms waiting for their owners to return home. Part of my initial post for the new month it is also going to have a wierd kind of housekepping vibe. I have a request of you all: not sure the blog is looking to some of you as it should, so (and I hope this ain't too tacky) am going to put an image of how it looks to me and would kindly ask you to let me know if that is how it looks to you. Does it look something like this on you browser? If so tell me, if not tell me even more. I must say the thorough-going discussion in last post's comments about what evil might or might not be was deeply interesting and thought provoking and I thank everyone who had a word in it. A most excellent debate. I hope it was edifying to both commentators and readers alike. It makes me wonder whether open questions are better than closed answers - by which I mean is it better to always be searching? And if we do find answers, what happens if we do not like them? Discard them and keep searching? What if the answer with the best fit is the most uncomfortable? Anyway, enough philosophising - this is a blog about a frivolous adventure story not the depths of the human condition. The Explicarium will be about the same length as Book 1 - roughly 100 pages, with whole new maps, floor plans, schedules and drawings of clothes and equipment. I hope this is happy news. This will be, from now until I change it I suppose, is to be my new profile image (along with a new title graphic too, it seems). It looks more like me than the previous illo - and it also happens to be a sneek peek into Book 2. What or who is your favourite monster of all time? Just a quick post to say that there is an interview with Miss Erin over on her blog. Thank you to her for the opportunity! Some of the more famous currently are Pill and Berthezene (who was the etcher of the plate of the Slothog Rossamünd reads of in his pamphlet early in Foundling) and the near legendary Gouche. My own favourite is a relative obscure fellow, Economous Musgrove (originally of Fayelillian but now residing in Brandenbrass) - who studied under the master Frabritis - and struggles to find enough work to keep he and his wife "in biscuits". His most constant source of work is for a radical periodical called Quack! (a word whose closest equivalent in our world would be "blah, blah"). With a wide yet secret readership, Quack! spends most of its articles railing against the government and the Empire and the borish attitudes of the mass. All too frequently this vaguely monthly publication finds its self being shut down by local authorities under (dubious) Imperial direction; its gazeteers and emenders are served brief stints in gaol and all those who rely on its patronage (such as Economous) now looking for other work. As the "game" goes, almost as soon as they are released the gazeteer and emenders find some new secreted location to set up new presses (the old ones having usually been confiscated or destroyed), call in all the old "gang", reconnect with the ghostly crowd of their many mysterious distributors and begin to publish once more ... until they are once again raided and shut down. They are able to carry on so because of the patronage of some figure of great substance and circumstance who remains unknown to the authorities and even the gazeteer themselves. Ok, I am done now. "As to being "professional", an "author" and all that - yes it is weird. Indeed, I think my struggle through the entirity of Book 2 (Lamplighter) has been coming to grips with seeing myself as a writer, as being able to truly consider book writing as an actual future path for me. Not only was it the 2nd book in a series (always the hardest, they say) but it was my second book ever (which is also historically difficult). So my troubles were doubly doubled! Very glad to be nearing the end of the Book 2 journey, many folk have worked hard to make it as good as can be - and [just so you all know] it is off to printers soon." I would just like to say to all those who have taken the risk to come along on this whole MBT journey with me even when the rest of the series is not done yet: thank you. I intend to make it worth your while. ...btw, anyone tried the AUDIO CLIP function under links yet? It is a brief excerpt from the English audio version of Foundling. Opinions? Is it even working? For those speakers of the German tongue, there will be a Deutsch audio version of MBT coming soon. Well, I am back from a break in Sydney-town - should anyone be asking where I have been you may say I have been there, with my wife, re-energizing. But now I have returned. Given that I was born and raised on the south central coast of Australia (and that I am an indoorsy kind of fellow) I have never seen the marvel I saw on Foresters Beach on the New South Wales central coast. There had been a storm a few days before (or so we - my wife and I - were told by a stranger - a fellow walker - along the strand) and washed up on the whole length of the beach were dead, sun-dried blue bottle jellyfish. Their air-sacs were like brittle plastic, that popped loudly when trodden underfoot. Later we found more recently washed specimens still firm and rubbery, spasming and curling in on themselves when touched. The largest would have been no bigger than an apricot, fitting neatly in the palm of hand, yet their bright blue stinger stretched out across the sand for three feet or so. I have visions in my head of some story of such a wash-up of these gelatinous spawn. I see the local fishers and sea-side village folk come down to the beach to squash and hack and burn the little, defenseless jellies, wishing to destroy at least some of the sea-monsters while they are vulnerable and spare later griefs. This might all get written down someday. Hmm... again. Meanwhile, I have to pop off to spend the afternoon with my editor as we go over some of the last tweaks to MBT 2, Lamplighter. Almost there folks, almost there. As to the excellent questions posed last post, they have really got me thinking (and indeed one of them is answered in Book 2) and I shall get to them. Merry Fathers’ Day to all you dads for yesterday. I am going to take a moment this Monday arvo to answer some of the lingering questions. I do not think I will get all of them but I hope this handful will cut it for those interested persons. Hmm, religions and spirituality in the Hc is the big, little explored frontier in my thinking. My understandings as a Christian certainly informs my ideas and I very much look to Messers Tolkien and Lewis for guidance when it comes to the esoteric in a secondary world – how one satisfies ones own beliefs without preaching. I most definitely do not intend MBT as some kind of allegory – I too dislike it when I detect it, yet the problem of the universal ideas of the religious, the philosophical, the soulful, of what people believe, of right ways and wrong ways of thinking need to be considered, tackled, delineated, even if only for my own ellucidation. Certainly there are the falsegods, those massive, mis-shapen, deep-ocean dwelling monsters who once ruled whole peoples and wrestled with men and the urchin-lords (the nimuines) until they were driven from the land into the deeps. Other monsters too have probably been lionized and adored and sacrificed to over the centuries – I can see some wicked brodchin-beast terrorizing some remote, backward community, satisfied by some sacrifice of tender young flesh (ick!) Then there is universalism – the idea of a godless, clockwork cosmos and the supremacy of human thought. Then there is the hardest concept for me, that of the actual origin of the Alltgird, the world of which the Half-Continent is but a part: How did it get there? Why is there good and evil in the world? Where do the monsters come from? Why are there good the bad and the indifferent? And many such notions. I am still puzzling it all out – all a part of the fun of secondary world invention, and you get to watch me do it. The Hc and its surrounds are certainly not a complete idea, there is still so much work needed to make it function, so many gaps yet to fill. I think that publishers these days struggle with the idea of posters (they just are not the fad they once were when I was a lad) and the next best solution is that website I keep promising. As with so much to do with the Hc, the gap betwixt my wishes and the practicalities of implementation rarely correlate. I truly hope a poster of the map is published one day: the full thing measures 1 metre x 800 mm and looks great framed (yes, I have one on my wall – a very useful tool for reference) – which is why it has not reproduced as well as I would have liked in the books. What was I thinking making it that big and hard to produce!?!? The southern Verid Litus can be easily found on the existing map – it is quite simply the southern half of the Verid Litus (which means lit. “eastern coastlands”) consisting of such lands as the Verd Antique, the Laurent, Five Drains, Nought, Dice and Attica of old – to name a few. Essentially it is all the lands south of the mystic river Ix and north of the river Stivenrot. You’ll find it on Map 4 at the back of Foundling (p 429 I think) though it is – I confess – not easy to read all of the names there. By this I am assuming you mean the Navigationals, the Signals of Paths used by canny folks to find their way about at night. You’ll have to wait for more info on this I am afraid – time has run out. No previews of Book 2, sorry – I may get back to you on this but do not hold your breath. An excellent question. Though I do not really rp any more, I did once, even going as far as producing 3 different rp systems and settings. Indeed, fulgars and skolds are (in an altered form) leftovers from those heady early years; the Hc has some of its roots very much in my rp-ing days. Consequently, it is in some small part my intention in with explicariums at the back of each MBT to give enough information to those determined enough to use as source material for a campaign setting in whatever rule system they like. I kinda want people to play around with the concepts whether rp-ing, writing, drawing – I have discovered one piece of fan fic for MBT, which was an odd experience. I do have, as part of the debris of those former years, a rudimentary rp system but do not plan on developing it into a fully realized game. Indeed, I do not think my publishers are in the role-playing way of thinking anyways. Sorry about this, though I do hope the explicariums in Lamplighter (currently about as long as the explicarium in Foundling) and Book 3 will provide enough info for any campaigning needs. A little while ago I actually had a brief trade of emails with a fellow from Privateer Press Iron Kingdoms – a pleasant exchange (and apologies for I have forgotten his name… =/) – and would very much like to play a round or two of the game. I find steam-punk very appealing and the way it is handled in Iron Kingdoms very tasty indeed, but I must confess that I do not see the Hc as a steam-punk world, and certainly there is no magic in the typical, D&D sense; I have actually been somewhat deliberate in steering away from the genre some, though overlap has been unavoidable. Yet my use of tricorns and flintlocks comes more from my enjoyment of Nelson’s navy and such inventions as gastrines and seltzer lamps and potives and fulgars are all a part of my attempts to define a distinct notion. 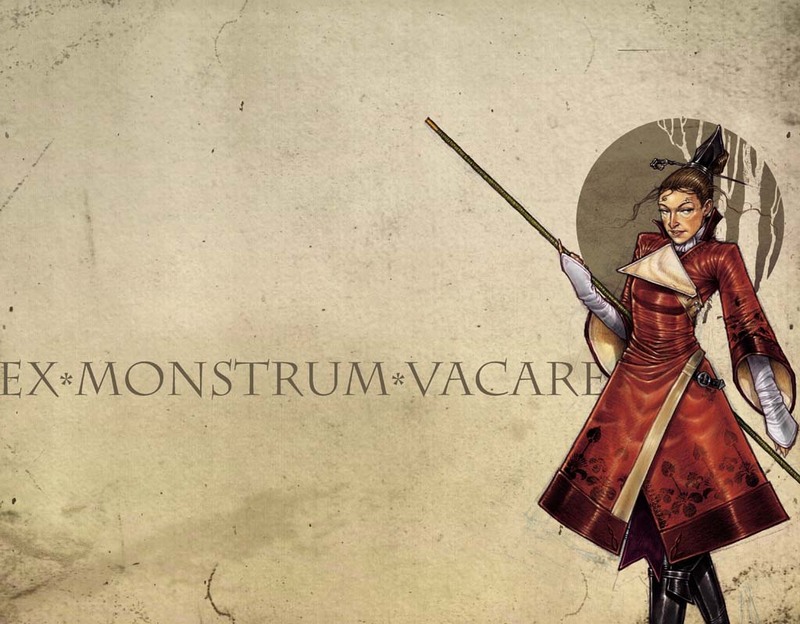 Never-the-less comparison is a part of the process of assimilation and I share many of the same inspirational sources as the fine fellows over at Privateer Press. Originality is a difficult and flighty bird, but I do strive to achieve as fresh a combination of the things that inspire as best I can, working and reworking and rethinking as much as I can to produce my own version of the vision. 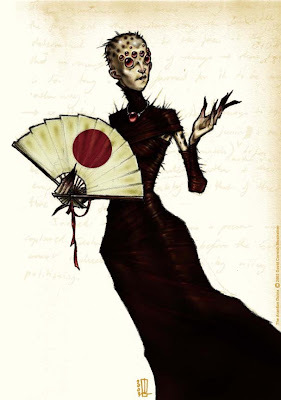 This is the Spider Queen – also known as the Duchess of Spiders, the Arean Dutrix, the Spinnerling – a monster-lord known as a petchinin (or tlephathine), mighty creatures who are ambivalent about mankind, seeking neither the harm nor help but simply wanting nothing to do with everymen. Yet even in this ambivalence their wrath is terrible should they perceive a threat to their demesne – then they take on the nature of the cousin wretchin-lords, vengeful and swift in their cruelty. The Spider Queen rules from the Spinningwood in the Undermeer on the south-eastern banks of Slithermeer Swamp, keeping hidden in the forest deeps, protected by the thorny woods and frightful whispers of her unseen threat. Today I will not tell you what I had for breakfast, just to mix things up a bit. editor = I came up with a neat term when addressing Celia Jellet (my most excellent editor here in Ozland, and Mister Travaglini (in the ol’ US of A) calling them verbemenders (“word alterers”) but that does not quite fit the bill I think – too obvious to my thinking. So I sat and thought and dug about and pulled out old note books and have begun to devise a whole hierarchy for the publishing “industry” in the Hc. So you have literarians, who publish serious works, and gazeteers, who provide the thinner works, such as the pamphlets Rossamünd enjoys. Now either of these might work on their own or be a part of a pressing house, which is essentially a publisher and printer in one establishment. Whether gazeteer or literarian, you will find emenders or formators (or formatrix for the girls) and these are your editors. Of these there will be a master formator, with two or three emenders and several under-formators in his/her charge; there are even freelancers known as emenders-at-large. Working the presses are the master plateman who has rule over the pressplates, under-platemen and the printing presses themselves. In more historied times the fore-runners of the literarian/emender was known as a glossapract, a publisher and editor in one, originally in Imperial employ to publish the bulls and banns of Imperial edict. Indeed, such fellows still exist as do such bulls and banns. And quickly, to Andre: it was my privilege to offer support - indeed, I am rather chuffed I could actually prove to helpful to another. Wonders will never cease. I just wanted to happily and gratefully acknowledge the CBCA Junior Judges for also nominating MBT as an Honour Book. A double honour in the CBCA is so brilliantly encouraging (I know I use these words a lot but it just so true, what else can I say?). Thank you Junior Judges, I hope your Participation Certificates look snazzy on the wall. This might be a good place to note that I am a tad disappointed with the meagre, near non-existent coverage the CBCA Awards receives here in the general OZ media (with a few excellent exceptions). It is almost as if outside of the community that is Childrens Publishing, we do not really exist - unless of course there is talk of DEAL$ Yet that is hardly a useful topic of discussion when what we are on about is children reading and adults acknowledging this as being important, indeed necessary. I do not recall caring much about DEAL$ when I was looking for books to read - indeed I still do not - I just wanted to know what was worth reading and what was not. Good thing for the electronical interweb, loads on kids lit and YA just there for the finding. Back to more positive things I am offering belated congratulations to Omnibus (ahh dear precious Omnibus) & Scholastic Australia for their win in the 2007 Australian Book Industry Awards in the Australian Export Success Award 2007 catagory with my own wee tome (and the further books in the series - they have made a huge assumption there that there will be more books in the series - just jokes!!!) You can grab a .pdf of all the winners from the ABIA 2007 here, but only if you really want to of course. For those who are not familiar with Australian parlance, "Melly" is short for Melbourne, and I have returned as the title of this blog suggests. As to the CBCA Awards I am so very very pleased to declare that not only was MBT 1 short-listed, it actually managed to make it as an Honour Book - which means silver, 2nd place! Now the book will get little silver stickers on it (well here in Australia it will) My hearty congratulations to the deep and delightful Ursula Dubosarsky The Red Shoe, my follow honour book awardee and to the wonderful Margo Lanagan Red Spikes, which took out the top spot, and deservedly so (IMHO) - though it is a shame they can not award gold to more than one. Here is the complete list of the CBCA 2007 results. Whilst there in Melly, my wife and I had a coffee with femina and she promptly informed me that my blogging-style of writing was not at all like my book-style of writing. I had this awful sensation like my underpants were showing or something. It was a good observation, and ties in with my own struggle with style and voice. The very text you are now reading is more how I talk, it is just written conversation - does that mean my words in the MBT's are too contrived? Would the books be better if I just wrote them like this? Then again, when preparing finished illustrations I don't just scribble the first thing that comes to me - I do roughs, I model and refine a drawing till I am satisfied. In the same way when writing I wrestle with the sound and feel of my words until I am satisfied. I can sit with my head down staring at the floor for a goodly long time just trying to compose one sentence. If I ever get to write more that MBT, if I ever get to explore this life of writing further, how much will my style change I wonder: will my books become looser - more modern, or shall my blogs become more wordy? As to Rossamünd’s face, madbomber expressed concern at it being revealed, and it may well be that in different countries different degrees of revelation occur. Does this mean I have copped-out, I sure hope not *looks worried*. 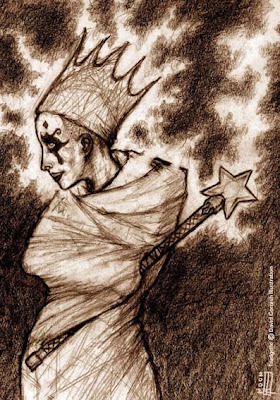 As a writer I am stubborn and argumentative, as an illustrator I am more agreeable and it was as an illustrator solving a brief that led to the drawing of Rossamünd’s profile. We will just have to wait and see. ... and yes, Mr Bomber, bless you, Dyan is a spectacular person indeed. It was more than fate that brought our paths together and I am greatful to have met her and for the strange events that lead to that meeting. Lord willing we will be working together for a long time to come. Here are the answers to the many questions that have collected over the last month. My publisher in the US has asked me to post more often so here is what I hope is a good start. I am actually supposed to be getting ready to go to Melbourne for the Childrens Book Council of Australia of Awards 2007, so apologies for any irregularities in this post. Helpful hints, huh? Not a “cheesy question” at all, ask away. I think it depends on how similar you mean, because if you want to start just as I did then do a Design Degree as an illustrator and begin to write ideas for an invented world in small notebooks. Degree done, go and work in another city for a decade, still filling notebook after notebook with more ideas. This step completed head overseas on a misconceived mission for a couple of months (still filling those little notebooks), bring ruin to your plans and hopes and crashland back in your home city without a job or a place to live (other than your old bedroom at your parents house). This crucial step done, pick yourself up and head down to your local children’s book publisher and try to get some illustration work. Having got said illustration work in the form of a couple of picture books, accidentally (and I mean accidentally) drop one of your notebooks (preferably #23) in front of the boss of aforementioned children’s book publisher. In doing so have this notebook snatched up by this personage and be drilled with questions about what it is and having explained haltingly as best you can, leave publishers with a request to write 1000 words about some of the ideas in the notebooks. Last step: turn 1000 words (with much help from publisher) into 83,000 words and call it Monster-blood Tattoo: Book 1, Foundling. That is how to do as I have done. Of course, if you were talking more generally, I feel very unsuitable for advice, above encouraging you to persevere and not to be surprised if life takes you places you had not first intended. What ever you do keep the ideas developing; try not to settle for anything too derivative rather tease your initial ideas out, massage them until they become truly your own. Is that all any help? I have indeed started Book 3, though still do not know what it will finally be called – that is very much up in the air. You are going to kill me but regarding the April 2008 release date I would say you could certainly put 2008 in pen but it was a good idea you asked because (unbeknownst ot me until recently) the month has been shifted to May (I know, Koallaka, I know – if nothing else it is character building) so that Lamplighter will be coming out precisely 2 years after Foundling. It is neat if nothing else. Can we expect a similar timeline for Book 3 (as yet officially titled, just a bunch of working ideas in the pipe at the moment)? Well, I cannot actually say – we will all (me included) just have to see I’m afraid. (I have already answered this question but I thought I’d respond to this directly again) Well the answer there is: yes. I have just signed a contract with the Jim Henson Company for a release date to be anounced (possibly 2010 – but do NOT quote me, this is just the bee’s buzz about the net). However, the signing of a contract in no way means the film will definitely be made, but that the goodly folks over at the Henson Company (who hear loved the Dark Crystal, the Story Teller series or Mirrormask? – I certainly did and still do…) have the option to turn the books into films. So no counting eggs yet, MBT might be unfilmable in the end – who knows. Even so it is so wonderfully exciting and encouraging – an I surely hope I might be allowed to participate: it has been a long long time dream of mine to be on the production design of a film. There too is no garuntee of this, the Producers need to be able to get on with their job – so we shal see. All in God’s hands. All very good points and areas of concern for me, too. However, Jim Henson Co. did what I think is such an artful and sensative treatment of Mirrormask I think they could be the best chance to make something deft and apt of MBT. Geracudd, Anthony.bradbury, Pearle, Paul A, Jacuc2, and very much to Tredanse – who appears to have done the bulk of the entry – for the time and energy spent logging all that information over there in Wikiland. Another picture for Coz – just ‘cause I can. This is Trudgette (whom giantfan has asked about – amongst other old images left lying about on the net) Trudgette is a fulgar from the Patricine, hence the rather over the top sparks about her, and not the nicest person you will ever meet – then again, I am not sure if one could ever meet a “nice” lahzar. That poor unnamed ettin from two blogs ago has been offered several promising names; Winter suggests “…something like Lurr or Krensh or Thunk or Stoneteeth for an Ettin, but if he's smarter he might have given himself a more fear inspiring name. "The Terrible Kreznar, Crusher of Bones" Is that too corny?” MooseGuy offers Rupert “… but Rupert is not so monster-y, so maybe Urngar… take a leaf from Winter's book, Urngar the Mostly Ferocious.” Coz says “ … name the monster Cozgar.” I like Coinks' idea that “an ettin would name itself after what it likes most”, now there’s a great thought. rosiegirl offers Schnard “…dont know why,” she says, “ just sounds sinister in my head :-)” Sounds sinister to me, too. “Well betide you.” This would be a common greating. “Hello”, “Hullo” or “Hallo” are all perfectly acceptable options. “Well a’day!” another, also “Fine daisyhay to ye!” Then of course there are the greetings in other languages but time is of an essence at the moment so they will have to wait. giantfan asked a whole lot more but these shall have to wait. I just wanted to thank Dustin for your extremely encouraging comment and for the risks you took making the display, bearing the ire of your boss for the sake of MBT. I love that advanced uncorrected proof (I think “they” call them ubers or something) – I have a copy of my own and it is a very neat little package. Yes yes, technical issues are making it hard to get a fully realised blog to you as promised but the expanded issue is coming very shortly. The faithful regulars will be getting used to this stop start thing I suppose - certainly not my preferred method of blogging but I will get a handle on this as my crammed schedule allows. The potential names for that ettin are universally excellent and I mull over them even now; thinking a combination of some plus a bit of my own thing will be the end result - we shall see. ... and for those distressed by the fact of the wait for Book 2 all I can continue to say is very very sorry, a book is only late until it released but is bad forever - I sure hope you find it worth the withdrawal. To those who have expressed admirable patience, thank you so much. Either way I am very encouraged: it is a privilege to have people eager to read on and I can let you know that I puzzle over Book 3 even as you read. Its title is up for grabs now, any previous ideas for possible Book 3 title are no longer valid as I wrestle with what happens next. Finally I can confirm that a contract with the Jim Henson Company has been entered in to, that a film of the MBT series is possible, though at this stage there are no guarantees. There is still a lot yet to be sorted before a film can actually happen, so watch this space for any further developments. Either way, very exciting indeed. 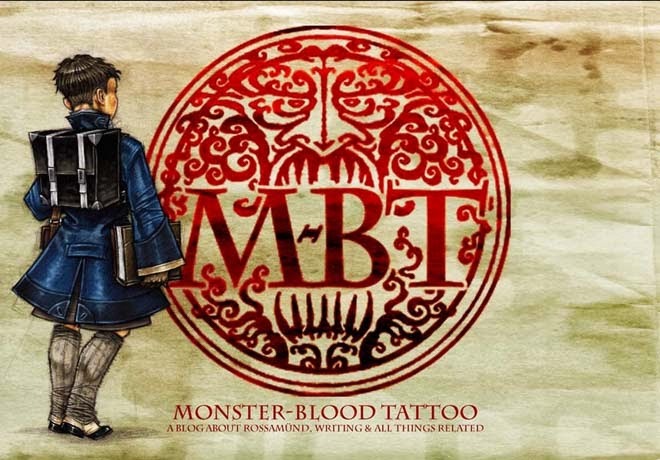 Welcome to the Blogging Home of Monster Blood Tattoo otherwise called (in the US & Canada) The Foundling's Tale. Here you will find Links to Interviews, an Audio Extract, Reviews in Many Languages, Word Games, Insightful Polls, Miscellaneous Fripperies & other Things to Inform & Entertain. 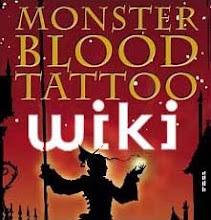 Monster Blog Tattoo will at times contain information that gives the plot of MBT Books 1, 2 or 3 away, just so you are warned. An article in Publishers Weekly including an interview with Dyan Blacklock my discoverer & subsequently my publisher. A wit & a fulgar of equal experience are fighting each other, who will win? Who likes to sniff books? Who would be interested in a somewhat regular choose-your-own-adventure style story right here at MBT? Which more ordinary profession would you chose in the Half-Continent? Would you be interested in AND use an MBT dedicated forum ? 3rd Poll: Which kind of adventure-seeking bravoe might you be? 2nd Poll: Would you like to see what Rossamünd looks like - have me draw a view of his face? Inaugural Poll: Who do you most wish to read about in their own story? Definition: A cruel and brutal fellow. Reading Matters, a review with quotes and all! Bokbloggen by our own Anna!